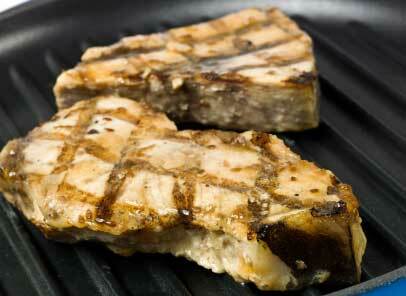 Swordfish, along with tuna, salmon, and Mahi Mahi, are ideal for the grill. The high oil content will keep the steaks moist during cooking. Have your fishmonger cut the steaks about 1/2-inch thick and then remove the bloodline from the center of the steak, giving you two pieces from each steak. Serve these tasty steaks with grilled asparagus, rice pilaf and lemon wedges.